The next local athlete I’ll be introducing you to is Gary Martin. Originally from the UK, he and his lovely wife Zoé are super involved in the Pemberton community and this will be Gary’s first IM. 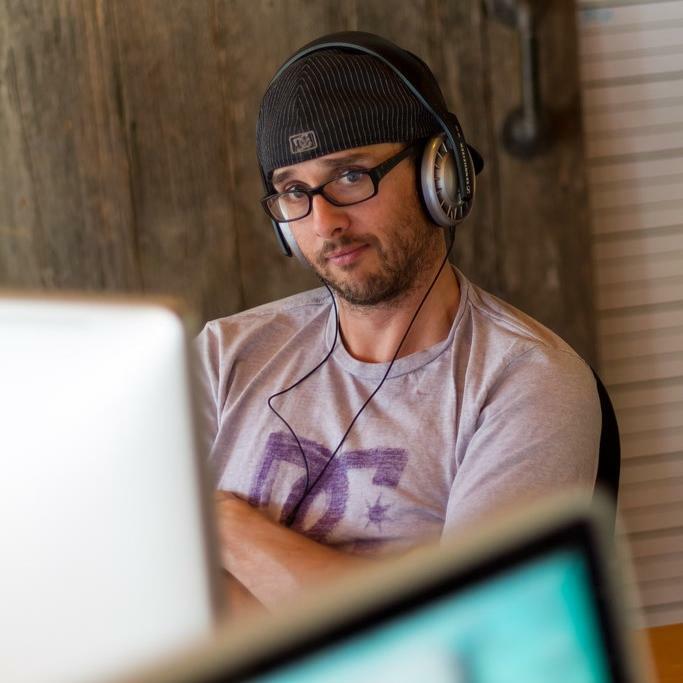 A talented graphic designer, I first met him through work and often pictured him rolling his eyes at me as I sent over yet another design request/change/variation and cursing me as a client! More recently, I’ve seen Gary zip by my house every so often, looking super-focused and intense, and have often thought to myself that we should team up for some training, but read on and you’ll know why I’ve now been convinced to zip my lip. I guess not everyone wants/needs a blabbermouth following them around! Tell me a little bit about yourself, you family and your lifestyle. How long have you lived in Pemberton? I’ve lived in Pemberton since early 2008 having moved to Canada with my wife Zoé. I’m a graphic designer so spend far too long sat in front of a computer but try to make the most of my time away from the screen by enjoying the great outdoors and exploring this fantastic valley I get to call home. Tell me about your athletic background. I’ve always been very athletic and competed in judo, swimming and bmx before even getting to high school. From there I made the most of all of the opportunities to be on pretty much all of the school teams. Football, rugby, basketball, field hockey, athletics, you name it, I did it. During high school I was lucky enough to learn how to ski and then snowboard, my love for winter sports was born which is one large reason why I now live where I do. What inspired you to try your hand at triathlon? When was your first race? Having swam and run competitively as a kid and given my love of biking, triathlons have always interested me but there was no real opportunities to try them back in the UK. A buddy of mine got me interested in running marathons a few years ago so over the winter of 2008/9 I set to work and got training. Completed my first race in 3:40:00 and then came back a year later to run it a little quicker at 3:28:00. During the summer of 2010 the same buddy that got me running was looking for a swimmer to be part of a team for the Squamish Triathlon. That sounds like fun I thought so I grabbed my surf wetsuit and headed off to the lake to start training. Really enjoyed being a part of the race so decided that I would do the whole thing myself next summer. 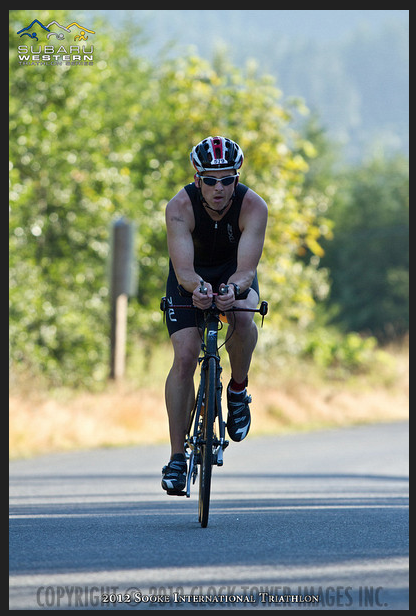 As a result in 2011 I completed my first ever triathlon again in Squamish with a time of 2:26:00. What drew you to Ironman in particular? 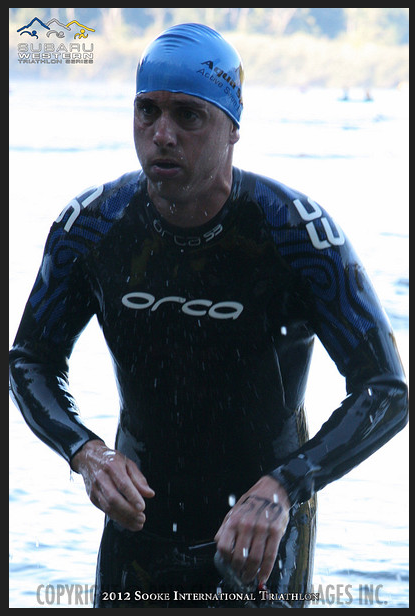 After my first triathlon in 2011 I decided that although it was fun it was over too quickly, my solution was to sign up for the 2012 Subaru West Coast Triathlon Series so completed my first Half Ironman Triathlon in Vancouver (4:48:00) followed by another in Sooke (5:10:00) and then an Olympic distance in Banff (2:23:00). After this busy summer I said to Zoé that she didn’t have to worry as I enjoyed the Half Ironman distance but had no desire to do a full one. This all changed however when Whistler confirmed that the race was coming to town and I just couldn’t pass up the opportunity to race where I live and have trained for the last few years. What has you most excited about taking the start at Ironman Canada 2014? I’m ridiculously meticulous with my race preparation and every event I enter I like to pre ride, walk, run or drive the course. I’m so excited for the race as I know every inch of the course having trained on it over and over again. The course is so amazing and to be able to share it with other triathletes is so awesome having visited plenty of amazing places in my short triathlon career. Do you have a particular goal for this race? Yes, I’d love to finish in under 11 hours. Myself and three of my friends are also competing, we’re the Pan Pacific Whistler Ironmen. Two of us are married to the Pan Pacific while the other two work for the hotel brand. We’re trying to raise $10,000 for Canuck Place Children’s Hospice so also have this as a race related goal as well as trying to beat my three friends. Will you complete any races prior to Ironman? Yes, I’ve already completed the April Fools Half Marathon and have signed up for the Subaru West Coast Triathlon Series again. 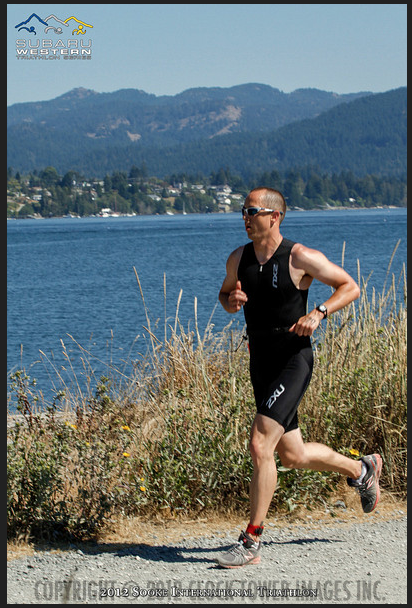 I’ll be competing in an Olympic distance in May over on Vancouver Island at Shawnigan Lake, a Half Ironman again on the Island in June in Victoria before a final Olympic or Sprint distance depending on how I’m feeling at the beginning of July in Vancouver. How did you find training through the winter months? How many hours on average do you train per week? After training through the winters for the Vancouver Marathon at the beginning of May I’ve actually learned to love winter training. Running in the winter rocks, snow, cold, -20°, awesome. Not so easy for the biking but a trainer in the garage with the iPad makes it bearable and swimming up and down, up and down makes no difference to the time of year. It’s been progressively building over the last month or two and I’m now up to about 15 hours a week. Can you describe a typical day during a heavy training week? They vary so much from day to day right now that there’s nothing typical about them to be honest. To give an idea of what I’ve been up to though last week I rode 250km, ran 50km and swam 10km along with a trip to the gym, the chiro and the physio! Are you able to find balance with work, life and training or did “something have to give”? So far its not been too bad although my wife did comment that she hardly ever sees my as I’m either sleeping, working or training. I’ll remind her of this in a few months time when training is over and she’s moaning about me being home all the time. 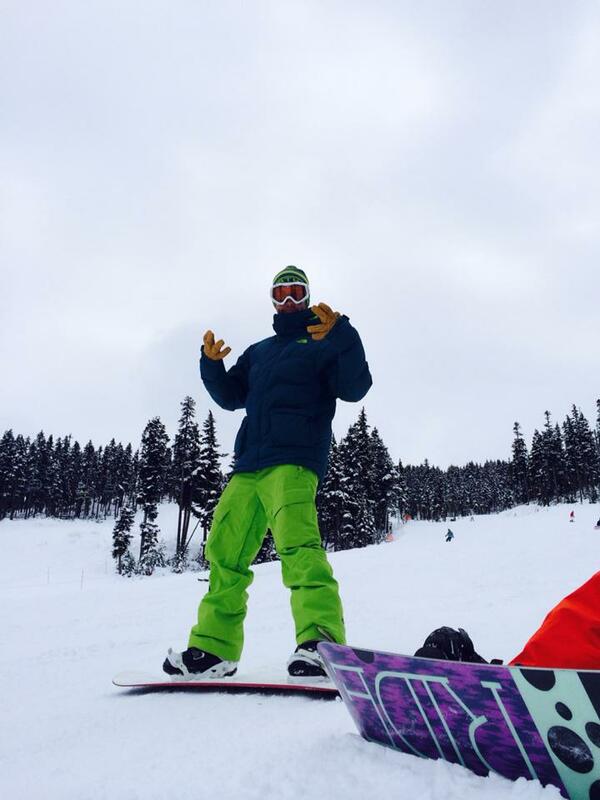 I did pass on buying a season pass for Whistler Blackcomb as I really didn’t want either the distraction or risk of injury get in my way, good choice in the end after the mediocre season we had. What do you consider your strength on race day? What about your weakness? I consider my biggest strength to also be my biggest weakness. I love the bike and love the bike course but as a result I really need to make sure I don’t go too hard and remember that I still have a marathon to run. I got carried away at my first triathlon and had a great ride but a horrible run. This is why I love training on the course as I’m getting to know just how hard I can go and what gear I need on every kilometre. What sporting/athletic accomplishment are you most proud of? I was super proud when I finished my first marathon, growing up in the UK I always watched the London Marathon every year and always thought how tough it must be to run that far, I was right! I was also really proud with my result in Sooke in 2012. Given the lack of experience and the fact that I just found a training plan online and trained for six months on my own with no extra help it was so cool to see my name on the results list in 10th place. What do you find most enjoyable about training? Is there anything that you dread? So many people say that they find training lonely, this in fact is what I like most about both it and racing. Training with other people distracts me and stops me from focusing, a 20km run or 150km bike is a great way to clear your mind and not have to worry about anyone else. I wouldn’t have said there’s anything I really dread, I’d be lying if I said I look forward to the 4am alarm calls but I never dread them. I’ve really loved training this year and think I’ve actually only missed maybe 3 sessions this year and those have all been due to injury rather than dread. What are you most looking forward to once you cross that finish line? Being able to get back into the life I had before Ironman. Its a huge commitment to dedicate your life to such a big race. Having a cup of tea with my wife, taking our husky out for his bedtime walk, exploring Pemberton at the weekend with Nixon (our husky) and sharing a nice bottle of red, these are the things I’m most looking forward to getting back. Where do I start! When I said I’m meticulous I meant it. My superstitions and rituals begin the night before the race, haircut, shave (both my legs and face), spaghetti bolognese and layout all of my race gear. Early rise, walk the dog, roasting hot shower, breakfast, if these things don’t happen then let’s just say it messes with my mojo! Name 3 things you can’t live without while training and racing. Zoé pointed out her disappointed at being listed after my iPod and Glide in my 3 can’t live without things so here’s the order I think it might be best I list them in: The support of my wife, iPod and Glide. If you could have your dream day – perfect racing – describe it. A dream day would be a perfectly flat lake with comfortably warm water, endless kilometres of smooth black asphalt with no wind and blue skies and even more smooth black asphalt to happily run 42.2km on. The perfect day would then continue with a nice glass of wine on sunny patio with my wife and poopy dog, happy days. If you could pick 3 dream sponsors, who would they be? Cervelo, New Balance and Oakley. I was lucky enough to get a P3 last year and love it. NB has kept me going injury free for the last 6 years since I started running and I’m off to buy another pair this weekend after wearing another pair out. I’ve work Oakleys for years for my reading glasses and got a pair of a Race Jackets this year, so comfy, so awesome and so good being able to see and not have to stick contacts in my eyes. If you could pick 3 dream training partners, who would they be and why? There are athletes who I both respect and admire but like I have previously said I love to train alone so if I could stay solo for training that would be my dream. What’s your favourite way to recover after a hard race or workout? Smoothie, hot shower, compression tights. So many people I talk to about recovery love to eat, it takes me a while to feel hungry after a hard race or a workout so the smoothie does the important instant food and gets my through a few hours before I get my hunger on and eat like a horse.